How to Construct a Circle From 3 Points: A circle can be constructed from 3 non-collinear points. Manipulative 1 - How to construct a circle from 3 points using Geogebra Created with GeoGebra. A circle can be constructed from 3 non-collinear points. 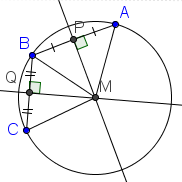 1 Construct lines segments AB and BC. Euclid. Elements. Book 1. Proposition 1. To draw a straight line from any point to any point. 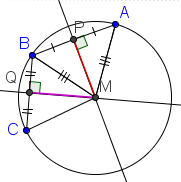 2 Construct the perpendicular bisectors of line segments AB and BC. Euclid. Elements. Book 1. Proposition 10. To bisect a given finite straight line. 3 Mark the intersection of the two perpendicular bisectors as M.
4 Construct a circle with center at M and radius MA. Euclid. Elements. Book 1. Postulate 3. To describe a circle with any center and radius. 1 Start with the completed construction. I say that the circle ABC is a circle that passes through points A, B, and C.
2 By the definition of a perpendicular bisector, the perpendicular bisectors PM and QM divide segments AB and BC into two equal parts and are perpendicular to AB and BC. 3 Construct segments AM, BM, and CM. See Euclid. Elements. Book 1. Proposition 1. To draw a straight line from any point to any point. 4 Since AP=BP AND ∠APM=∠BPM, and PM is in common, by angle-side-angle congruence, ΔAPM=ΔBPM. 5 Since ΔAPM=ΔBPM, line segment AM=BM. 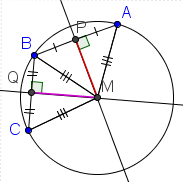 6 Since BQ=CQ AND ∠BQM=∠CQM, and QM is in common, by angle-side-angle congruence, ΔBQM=ΔCQM. 7 Since ΔBQM=ΔCQM, line segment BM=CM. 8 By common notion 1, since AM=BM and BM=CM, then AM=CM. Since AM=BM=CM, points A, B, and C are equidistant from M. So a circle with center at point M and radius AM passes through B and C. Q.E.D..
Table 2: Proof of construction. McAdams, David E. How to Construct a Circle From 3 Points . 7/25/2018. All Math Words Encyclopedia. Life is a Story Problem LLC. http://www.allmathwords.org/en/h/htconstructcirclefrm3pnts.html.